Hello and welcome to another edition of A Slice Of Soap. There’s still time to enter this week’s caption competition so get scribbling and make us all laugh. Hey guys, as we all know, last month Barbara Windsor announced that she’s leaving EastEnders. The news has come as a real shock not only to fans of the soap, but also to some of the stars of EastEnders aswell. Simons added: "I’d hate to see Peggy die a gruesome death, so hopefully she’ll go with the door left open – then if she ever wants to come back, she can." She continued: "It hasn’t sunk in that Barbara’s leaving because we’ve been working together so much. But it’s her decision and whatever she wants to do, we’ll all support her." Well, I don’t know about you soapsters, but as far as I’m concerned, EastEnders just won’t be the same with out Barbara Windsor. I hope she’s not killed off, cos at least that way we’ll always live in hope that she’ll return to Albert Square some day…a bit like her wayward son Grant Mitchell. 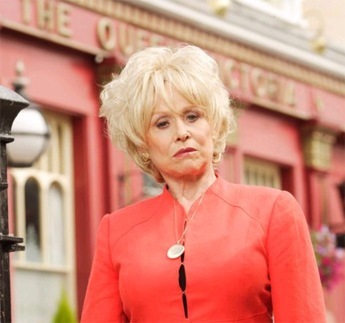 Anyway, what do you think soapsters…should Peggy Mitchell be killed off or should she be written out of EastEnders? Let us know your thoughts by leaving a comment. That’s it for me, I’m out of here. Don’t forget to try our caption competition and join me on Friday for more soap news and gossip. Got a comment about your favourite soap, this blog or anything else? Share it with me.